XWest: 'We're ready', you said. Useless. West: You failed just as you always have and always will. I curse the day I took a chance on you. Get out of my sight. Lena: I wouldn't do that, Ms. Jourdain. Miri: Of course not! Such luck for us, to happen on the only honest girl in Lowtown! What a comfort it must be to your 'business sponsor' -- you stay bought. Kris: Wasn't that fun? Isn't it just wonderful that the empire is taking such a keen interest in us? West must be so pleased! Miri: You remember what I've said. Kris: The more I'm around that woman, the more I regret not filling her office with rats. Lena: I wish I'd never stopped you. Kris: Are you all right? You're shaking. Lena: Just... a little cold. Kris: Really? I'll get your jacket. Well, well, well. The Empire. This is going to get interesting. Lena: I don't doubt it. Business sponser: As l'affaires grew, Thorn and his cadres hit on a problem: they needed educated people to handle their increasingly labyrinthine concerns, accountants, cyber-adepts, personal doctors, lawyers, and other specialists who'd been trained for more than hitting problems until they went away. But in actually hiring these specialists, they were not only picking up the leavings of the more lucrative (and socially acceptable) corporate headhunters, but hiring people from an upper middle class background who often had a poor understanding of how the business worked. They were high-handed and snotty to the 'help'; they snubbed the wrong people; they assumed they were smarter than their employers; they failed to take a reproving beat-down in the proper spirit, and sooner or later, there you were, sending someone for a mop and bucket and in need of yet another damn accountant. The solution for most was to pick out some of the best and brightest from their street gangs and pay their way through college, which landed an employee who understood the system and owed you a massive debt of gratitude. That fake scholarship funds turned out to be an excellent way to launder money was merely a bonus. Lena's scholarship is need-based and has Imperial matching funds, sort of a gold standard for genuine-ness, but this isn't the first time she's faced this particular misunderstanding and it's unlikely to be the last. It's a comfortable assumption for her peers. Anyway! This is the end of the scene and also the end of my buffer, so I am going to be taking a few weeks off to rebuild -- I figure better now, at a natural break point, than unexpectedly later. I'm hoping to keep it to two, but looking at my October work schedule it may stretch. I'll try and keep you guys in filler while I stock up some breathing room. 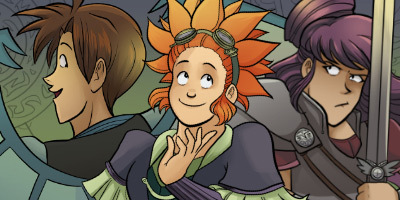 The world-hopping comic adventures of a questionably moral one-winged magician, his cheerful mechanic minion, and the overzealous paladin out to stop him. Or save him. Or possibly get distracted, drink too much, and wreck the bar after losing her shirt in an arm-wrestling competition. She seems slightly confused on this point. Sombulus is a delightful comic that mixes flying toasters, sulky undead kings, and magical soap operas into a magical romp and never fails to make me laugh. Read it -- you won't regret it! When Kota wakes up one morning to discover he has superpowers, he does what any right-thinking teen would do: tell all his friends, so they can experiment on him! Of course, when your friends consist of a mad scientist, a sword-toting precog, and a swarm of sentient (and annoying) nanobots, your idea of right-thinking may be a little warped. But when Kota's new powers attract the attention of the mysterious alien Destiny, he'll need help from all his friends to keep him out of trouble -- and maybe a little extra boost from the Science Hammer. 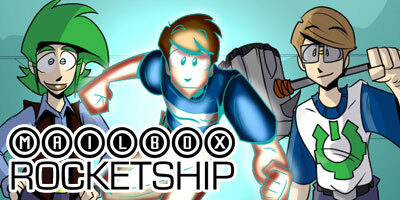 Mailbox Rocketship is a fun, zany comic that I find ridiculously charming. Check it out: you will too!